DETROIT Smart pitching. Clutch hitting. Sharp fielding. Plus an MVP Panda. All the right elements for a sweet World Series sweep for the San Francisco Giants. Nearly knocked out in the playoffs time and time again, and finally pressed by the Detroit Tigers in Game 4, Pablo Sandoval and the Giants clinched their second title in three seasons Sunday night. Marco Scutaro  who else?  delivered one more key hit this October, a go-ahead single with two outs in the 10th inning that lifted the Giants to a 4-3 win. "Detroit probably didn't know what it was in for," Giants general manager Brian Sabean said. "Our guys had a date with destiny." On a night of biting cold, stiff breezes and some rain, the Giants combined the most important elements of championship baseball. After three straight wins that looked relatively easy, they sealed this victory when Sergio Romo got Triple Crown winner Miguel Cabrera to look at strike three for the final out. "Tonight was a battle," Giants star Buster Posey said. "And I think tonight was a fitting way for us to end it because those guys played hard. They didn't stop, and it's an unbelievable feeling." Posey, the only player who was in the starting lineup when San Francisco beat Texas in the 2010 clincher, and the underdog Giants celebrated in the center of the diamond at Comerica Park. They built toward this party all month, winning six elimination games this postseason. In the clubhouse, they hoisted the trophy, passed it around and shouted the name of each player who held it. "World Series champions," Giants outfielder Hunter Pence hollered. Benched during the 2010 Series, Sandoval, nicknamed Kung Fu Panda, went 8 for 16, including a three-homer performance in Game 1. "You learn," Sandoval said. "You learn from everything that happened in your career. ... We're working hard to enjoy this moment right now." Cabrera delivered the first big hit for Detroit, interrupting San Francisco's run of dominant pitching with a two-run homer that blew over the right-field wall in the third. Posey put the Giants ahead 3-2 with a two-run homer in the sixth and Delmon Young hit a tying home run in the bottom half. It then became a matchup of bullpens, and the Giants prevailed. Ryan Theriot led off the 10th with a single against Phil Coke, moved up on Brandon Crawford's sacrifice and scored on a shallow single by Scutaro, the MVP of the NL championship series. Center fielder Austin Jackson made a throw home, to no avail. "That's what it makes so much special, the way we did it," Scutaro said. "We're always against the wall and my team, it just came through first series, second series and now we sweep the Tigers." Romo struck out the side in the bottom of the 10th for his third save of the Series. The Giants finished the month with seven straight wins and their seventh Series championship. They handed the Tigers their seventh straight World Series loss dating to 2006. "Obviously, there was no doubt about it. They swept us," Tigers manager Jim Leyland said. "So there was certainly no bad breaks, no fluke. "Simple, they did better than we did," he said. "It was freaky. I would have never guessed we would have swept the Yankees and I would have never guessed the Giants would have swept us." The Giants combined for a 1.42 ERA, outscored the Tigers 16-6 and held them to a .159 batting average. "I think we never found our confidence at home plate," Cabrera said. "It was not the same game we played. We could not find our game in the World Series." 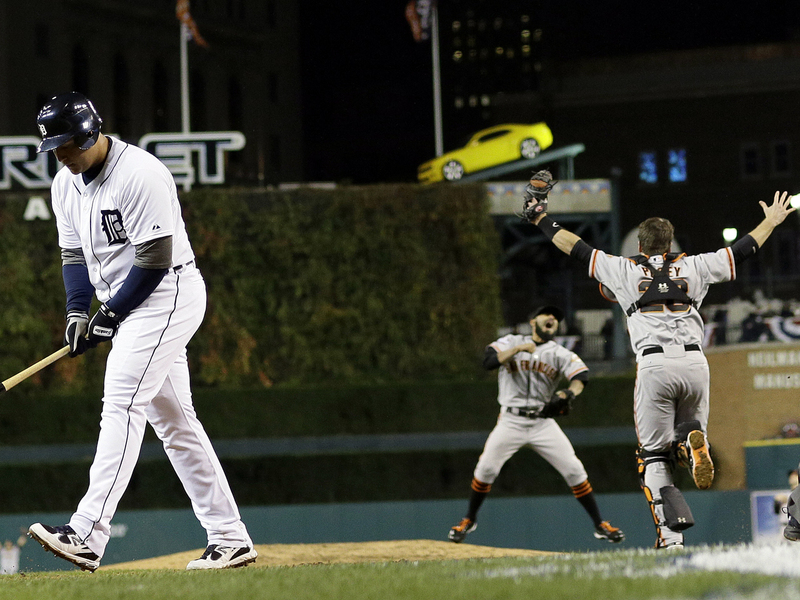 Bristled slumping Tigers slugger Prince Fielder: "This is not about me. This is about the team." An NL team won the title for the third straight season, a run that hadn't occurred in 30 years. Some find the streak surprising, considering the AL's recent dominance in interleague play. Yet as every fan knows, the club that pitches best in the postseason usually prevails. Until the end, the Tigers thought one big hit could shift the momentum. It was an all-too-familiar October lament  Texas felt the same way when the Giants throttled it in 2010, and Tigers knew the feeling when St. Louis wiped them out in 2006. "For one, we didn't allow doubt to ever creep in," Pence said. "You know, the thing that made this team so special is just playing as a team, caring for each other. We had our backs against the wall and we knew it wasn't going to be easy. It's not supposed to be." Howling winds made it feel much colder than the 44 degrees at gametime. Two wrappers blew across home plate after leadoff man Angel Pagan struck out, and fly balls played tricks in the breeze. The Giants started with their pregame ritual. They clustered around Pence in the dugout, quickly turning into a bobbing, whooping, pulsing pack, showering themselves with sunflower seeds. A big league good-luck charm, Little League style. "That was one of our mottos, and we went out there to enjoy every minute of it and it was hard earned. Just an incredible, incredible group of guys that fought for each other," Pence said. Once again, San Francisco took an early lead. Pence hit a one-hop drive over the center-field fence for a double and Brandon Belt tripled on the next pitch for a 1-0 lead in the second. The next inning, Cabrera gave the Tigers a reason to think this might be their night. With two outs and a runner on first, Cabrera lofted an opposite-field fly to right  off the bat, it looked like a routine out shy of the warning track. But with winds gusting over 25 mph, the ball kept carrying, Pence kept drifting toward the wall and the crowd kept getting louder. Just like that, it was gone. Cabrera's homer gave Detroit its first lead of the Series, ended its 20-inning scoreless streak and reaffirmed a pregame observation by Tigers Hall of Famer Al Kaline. "The wind usually blows to right at this time of year," Kaline said. In the fourth, Max Scherzer and catcher Gerald Laird teamed on a strike 'em out-throw 'em out double play. Trailing for the first time since Game 4 of the NL championship series, Posey and the Giants put a dent in Detroit's optimism. Scutaro led off the sixth with a single and clapped all the way around the bases when Posey sent a shot that sailed just inside the left-field foul pole for a 3-2 lead. Detroit wasn't about to go quietly, however. Young, the ALCS MVP against the Yankees, made it 3-all with another opposite-field homer to right, this one a no-doubt drive. Fielder finished 1 for 14 (.071) for the Series. All 24 teams to take a 3-0 lead in the World Series have won it all. In fact, none of those matchups even reached a Game 6. This was the first sweep for an NL team since Cincinnati in 1990. Working on nine days' rest and trying to extend the Tigers' season, Scherzer kept them close into the seventh. Often recognized for his eyes  one is light blue, the other is brown  he's also known as a solid postseason pitcher. Ditto-plus for Matt Cain, who was working on a nearly perfect year. The Giants' ace threw a perfect game in June, was the winning pitcher in the All-Star game in July, beat Cincinnati to clinch the division series and topped St. Louis in Game 7 of the NL championship series. After they left, the relievers decided it. Octavio Dotel shouted, "Yeah! Let's go!" toward his dugout after striking out Posey to end the eighth. In the bottom half, winning pitcher Jeremy Affeldt got around a leadoff walk when he struck out Cabrera, a flinching Fielder and Young. Coke returned the favor in the top of the ninth, fanning the side. With Jose Valverde having lost his closer role during a shaky month, Coke stayed in for the 10th and faltered. The Giants became the first champion that hit the fewest home runs in the majors since St. Louis in 1982. Sandoval's three drives in Game 1 started San Francisco's romp, and its dominant pitching took over from there. The parade to a sweep masked the problems San Francisco overcame to get this far. Closer Brian Wilson pitched only two innings before an elbow injury ended his year. All-Star game MVP Melky Cabrera was suspended 50 games for a positive testosterone test, and not welcomed back when the ban ended. Two-time Cy Young winner Tim Lincecum struggled and wound up in the bullpen. Swept in a three-game set at Arizona to start the season, the Giants were floundering under .500 in mid-May. They soon hit their stride and, boosted by trade deadline deals for Scutaro and Pence, passed the Dodgers in the NL West for good in late August and posted 98 wins. Getting past Cincinnati and St. Louis in the playoffs presented challenges. Down 2-0 in the best-of-five division series, they rallied for three straight victories in Cincinnati. Trailing the defending champion Cardinals 3-1 in the NLCS, they again took three in a row to advance, clinching in a driving rainstorm. Six elimination games, six wins. Facing the Tigers, San Francisco proved it could play with a lead, too. The Giants became the first NL team since the Big Red Machine in the mid-1970s to win two titles in a three-year span. Shut out for 56 years  Juan Marichal, Willie McCovey and Barry Bonds never won it all  their self-described "misfits" captured that elusive crown in 2010. The Tigers' flop finished off a season in which Cabrera became baseball's first Triple Crown winner since 1967. Detroit overtook the White Sox in the final week to win the AL Central and wound up 88-74, the AL's seventh-best record. Detroit 2B Omar Infante broke his left hand when he was hit by a pitch from Santiago Casilla in the ninth. ... Theriot and Laird had a nice reunion at the plate. They were St. Louis teammates last year when the Cardinals won the title. ... Laird started after Alex Avila was scratched. Avila's right arm was still sore after being hit by a foul tip in the opener. ... Ann Romney, wife of Republican presidential candidate Mitt Romney, was at the game. ... Cabrera has reached base in all 24 of his postseason games with Detroit.